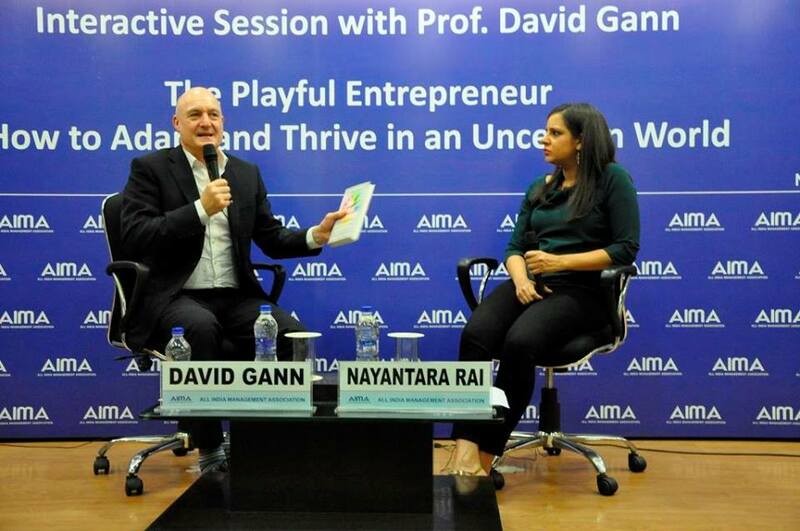 AIMA organised and Interactive Session on “The Playful Entrepreneur: How to Adapt and Thrive in an Uncertain World” with Prof David Gann, CBE, Vice President (Innovation), Imperial College London on Tuesday, 11th December, 2018. The session was moderated by Nayantara Rai, Chief of Bureau, ET NOW. 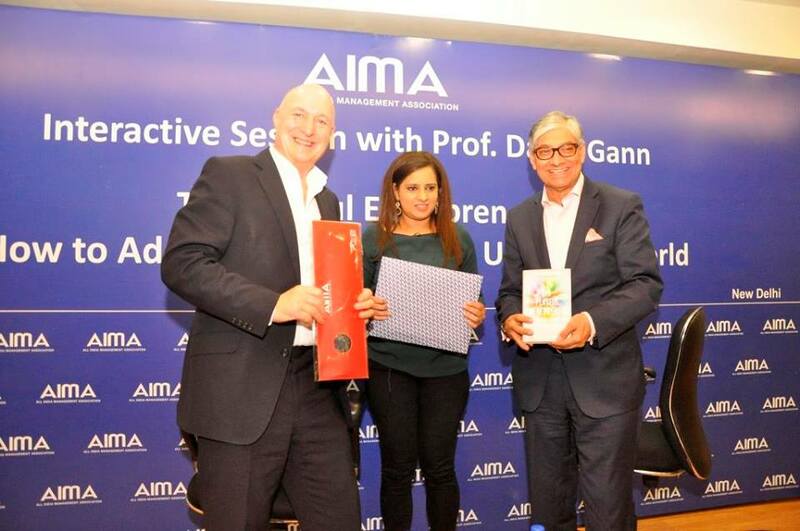 Rajive Kaul, Past President, AIMA and Chairman, Nicco Corporation initiated the session by welcoming the speakers and setting the context. The discussions at the session was based on his latest book Co-authored by Prof Gann and Prof Mark Dodgson. The session was well participated by more than 130 delegates from across industries and functions. Students from various educational institutes also attended the session. 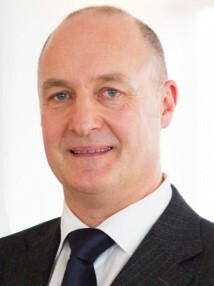 David Gann CBE CEng FICE FCGI is Imperial College's Vice President, leading Innovation. He is a member of the College's Executive Board. David is an academic, university leader, strategist and advocate, renowned for his work on innovation, entrepreneurship and technology management. His distinctive strength is in building relationships proactively and internationally, to connect ideas, research and solutions with substantial funding between academia, business and government. David was appointed Commander of the Order of the British Empire (CBE) in the 2010 Queen's Birthday Honours for services to engineering. He is the recipient of the 2014 Tjalling C. Koopmans Asset Award, for extraordinary contributions to the economic sciences. 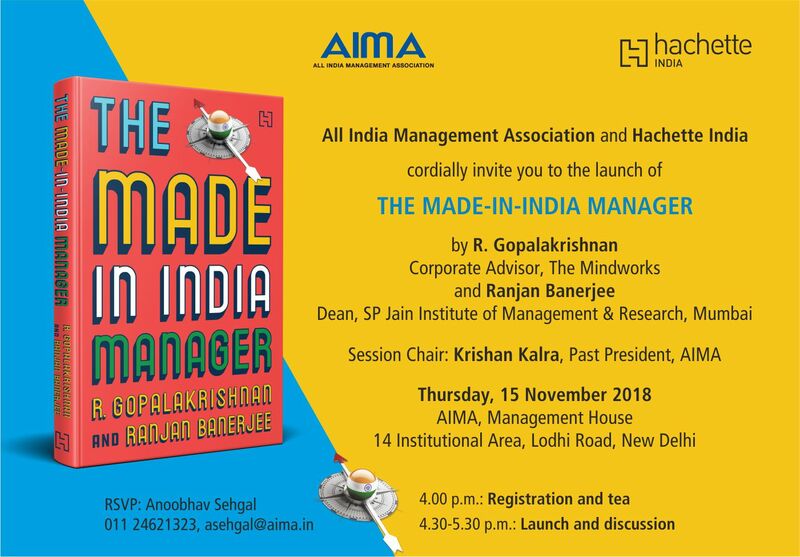 AIMA is organizing a session on The Made in India Manager with Mr R Gopalakrishnan, Corporate Advisor, The Mindworks, Former Director of Tata Sons & Dr Ranjan Banerjee, Dean, S.P. Jain Institute of Management and Research, Mumbai. The session will be held on 15th November 2018 at the AIMA Auditorium, Lodhi Road, New Delhi. Session timings being 04:30 pm - 5:30 pm. Registration at 04:00 pm. The session is based on the book authored by Mr R Gopalakrishnan and Dr Ranjan Banerjee, published by Hachette India. The session will be Chaired by Mr Krishan Kalra, Past President, AIMA. I am writing to cordially invite you to this interactive session and book launch. Please note that prior registration / confirmation is a must. I look forward to your confirmation to be part of this unique opportunity. Have you ever felt tongue tied when asked to give a speech? Have you felt you would love to speak fluently but have not been able to summon the courage to take the stage? Have you ever felt you would like someone to coach or just talk to you before you give your speech? Speaking to groups is an essential part of a leader’s job and anybody wanting a career in management cannot afford to have stage fright. However, most individuals grow up with the fear of the limelight because of polite upbringing and they must change for the sake of their careers. It is not hard to do. A combination of technique and retraining of mind can make it natural for anyone to speak in public. If you answered YES to any of the above, you are cordially invited for a Session with Ms Anusha Khurana, IRS, a speaker who has spoken both nationally and internationally for 20 years now and who has been training people on these lines. Her passion is public speaking and soft skill development. She has spoken in a variety of fora including management institutes, MNCs and PSUs. Friday 14 September, 2018 : 4.30 pm to 5.30 pm (Registration & Tea at 4.00 pm) : AIMA, Lodi Road, New Delhi. The session will be chaired by Mr Sumit Chaudhuri, Chairperson and Managing Director, Third Millennium Business Resource Associates Private Limited. Do take advantage of this unique session and participate. Please use the enclosed registration form and return to us. We look forward to having you with us on 14th September.